Spam (see comment). They probably intend to edit a URL in. @Zanna The OOF 1 compilation question got closed by but only needs one more vote to be reopened. I don't want to rush to close these as too broad, and I do think they have some value (though less so for the .tar.gz installation one)... but it seems to me that we allow questions of extraordinary breadth provided that they aren't phrased like software recommendation requests... even when they are software recommendation requests, like with the general file-renaming question. Q: How to easily rename files using command line? Q: How do I install a .tar.gz (or .tar.bz2) file? I have downloaded tar.gz files. But I don't know how to install it. How do I install this kind of file? Q: Video editing software options? What video editing software would you recommend on Ubuntu (or Linux in general) and why? It can be for either beginners or experienced users. Please only place one piece of software per response and include details to what makes it great! A historical lock is actually the resolution to the discussion there and there for that video editing question that I prefer. I think we could also have just edited the question to narrow its scope to approximately the way it was already being interpreted, by making it ask for video editing software that is "fully featured" for some explicitly clarified meaning thereof (listing a few common features, perhaps). That's why I voted to reopen it. But I'm not sure it would really do us all that much good that way, and a historical lock is totally fine with me. I wish it were effectively so broad it couldn't be fixed, because that would mean there are way, way more reasonable choices for video editing programs on Ubuntu than there actually are or have ever been. As it is, the topics of installing software from a compressed archive and bulk file renaming (even choosing a utility to perform bulk file renaming) are considerably broader, but nobody, with the possible exception of me right now, seems ever to have expressed any objection. Is this NAA? I'm not really sure. Also, do we have another Chrome and Chromium backup question that this one can reasonably be duped to? @EliahKagan I started the reopen, so can't help :( thanks for commenting! @EliahKagan The OP added information in a comment and the question was edited with this additional information. Also this question is probably clear enough now that your CV can be retracted, see my answer to it for more information. @EliahKagan The only reason why I posted an answer to the otherwise silly gxsudo question is that gksudo has been dropped from the default 18.04 repositories for security reasons and it would be nice to post an alternative to using gksudo when it is no longer available. Why is this answer getting downvoted? @pomsky It also seems to me like it's a reasonable answer. Why redirect the output of pkexec thunar to /dev/null? pkexec thunar in an Xubuntu 18.04 system doesn't write anything to the terminal, for me. @pomsky I haven't downvoted it but it says, "Based on a cursory google search it would appear..." and doesn't link to, quote, or say anything about what sources were found. @karel Do you think the information added to the printing question is sufficient that it could be answered? Still, though. I did actually try running thunar in a terminal in Xubuntu 18.04, as root, with pkexec thunar. It didn't print warnings. If it did, I am not sure they wouldn't include anything of interest. Unlike some graphical programs, Thunar seems intended to be run as root sometimes. Its UI changes to warn the user that it is running as root. I'm not a big fan of suppressing warnings by default because some applications print useless information. Yeah, firefox doesn't seem to have an option for verbose messages, either. @EliahKagan I don't have an 18.04 system to test yet, so I tested my commands on 17.10. As soon as Ubuntu 18.04 is officially released a week from now, I'm going to install it and test my replacement for gksu command(s) on 18.04. You were able to run thunar as root on 17.10 with pkexec, and it printed useless messages when you did so? Yes I did, but I reasoned that if I test it on a pre-release Ubuntu 18.04, I maybe will have to revise it anyway after Ubuntu 18.04 is officially released so why not wait a week. Next week I'm going to test every instance of gksu in all my answers on Ubuntu 18.04 and revise whatever needs to be revised. Not much I think because I almost always posted about sudo nano instead of sudo gedit. Personally I prefer to say, "You may see some warning messages like..." (and then an example) "These are typically unimportant." I see why you might choose to put in the redirection if you observed the warnings on 17.10, though. I thought about the possibility too, but it occurred to me that sooner of later Canonical is going to fix the issue with warning messages when running some pkexec commands, and we'll finally have a nice replacement option for insecure gksu. Personally I always use only the terminal with sudo anyway so I don't have any problem with it no matter what happens. Maybe they have fixed it? I know you may not want to change any posts based on this -- especially since I haven't updated my Xubuntu 18.04 system for over 24 hours! -- but I'm curious to see what I get when I try running some other graphical programs as root. Well, some continue to have no Polkit profile and attempting to run them as root with pkexec fails. It doesn't effect me either way because the only app that I ever run from the terminal is nano anyway. You have to test every app with pkexec individually. Running them with sudo -H still works, and it does not seem to show those kinds of GTK+ warnings. Running xfce4-terminal as root with sudo -H shows a "Failed to connect to session manager" warning but it's the sort of warning I think users would probably want to see. the question is a dupe, although my answer doesn't exactly solve the issue, I believe this is the best one can achieve right now. I'm not sure what we should do with that question, and I haven't CV'd or reviewed CVs on it. But yeah, we do not have a policy that typos make a question no repro. Unix & Linux has such a policy... and in my view, they either shouldn't have it or they are interpreting their own policy badly. Very often typos are related to conceptual misunderstandings; perhaps as often, conceptual misunderstandings about syntax that don't actually involve typos (in the sense of mistaken typing) are wrongly seen as being about typos and closed. yeah seems pretty spammy. Is that link really related to the question? @EliahKagan I've seen the same confusions come up again and again on Unix & Linux and get closed. Searching for typo in /dev/chat (the Unix & Linux main chat) reveals numerous arguments over whether or not something involved an actual conceptual question, in which an extremely strong presumption that anything that involves wrong syntax is a typo has to be overcome. @Zanna I've commented, even though the post is old. I don't really want to say, "We didn't catch this when you posted it, but..." because I don't want to be advertising areas where the system hasn't caught spam. I also believe we can regard that as spam. Either way, I think it can certainly be deleted. Spam, VLQ, or NAA would all be fine for it, IMO. @pomsky Yeah, it doesn't. It's not very clear either. I've VTD'd it. Here on AU (but not on some other sites, like SO), I think we consider it reasonable to flag such answers as NAA, too. Not just because it covers the same ground as another answer, but because it does so in a way that either (a) differs not at all, or (b) as in this case, is just an unclear version of a previous answer. I don't have a meta post to site for this, though; it might not be a correct statement of our policy. @EliahKagan Yeah, I did flag as NAA. Did the top bar change to not show rep for either of you guys? In the past minute or so, it showed a rep increase for me. @AndroidDev when I view the full site on mobile, reputation and badges are missing, but that's been the case for a few weeks I think. I have not noticed any problems with it recently. This doesn't mean there isn't some bug that you're seeing, though. Was your cumulative rep change since you last clicked the achievewardaccoladements menu positive? It only shows changes when they add up to a positive value. So like, if you bountied something for 200 and then received a whole bunch of answer upvotes, it would take until the 21st upvote to show you rep change. @AndroidDev Sorry, I glossed right over your having said the rep wasn't shown at all. I'm having reading comprehension problems today, apparently. @Zanna Is there a bug reported for the problem you're having on the mobile app? I just got that on English Language & Usage. @AndroidDev Anyway, I do definitely recommend posting a bug report on Meta Stack Exchange if there isn't one already. The problem is on all SE sites, not just Ask Ubuntu, right? Why is this recent surge of answers (this for example) suggesting restarting network-manager out of context as a fix for network issues?! This comment is excellent. I wish we had a question specifically about the issue of what is responsible for assigning meaning to -- when it's passed to a shell builtin, with the contents of that comment as the answer. So I just pushed a bunch of questions to the homepage by only fixing a tag (people mistakenly used [cd] when they meant [cd-command]). Seeing how easy it is to make this mistake, I'm thinking of adding "For questions about the command cd, please use the [cd-command] tag." (in bold font) to the "Usage guidance (excerpt)" section of the cd tag. Does that make sense? I've even done that myself, so yes! @pomsky Yes. Usage guidance is an important (and often missing!) part of any tag wiki. Please do add it. @Zanna and @EliahKagan It seems the "excerpt" section allows only plain text, no Markdown formatting. Could you suggest a way to "decorate" the sentence to make it more "eye-catching" (but not over-the-top)? put it at the beginning? Or we could (this would require discussion on Ask Ubuntu Meta) get rid of the cd, or deprecate it like we did with installation, and have compact-disc for questions about CDs. I wonder if people would go for that, though. After all, we still haven't managed to remove installation from all the questions that have it. It's currently on 7,155 questions! > Compact discs are a form of removable media. (For questions about the cd command, use [cd-command] instead.) CDs can hold files (as well as audio tracks) and many computers have an optical drive for reading and writing data on a CD. > Compact discs are a form of removable media. For questions about the cd command, use [cd-command], not this tag. CDs can hold files (as well as audio tracks) and many computers have an optical drive for reading and writing data on a CD. Though the point about not using it for questions about the cd command is the most important thing to add, the tag wiki and especially the tag wiki excerpt for cd are also outdated. I don't think most new computers today have an optical drive, and (relating to the full tag wiki) I'm pretty sure CDs are no longer a common installation medium for Ubuntu, considering that even the more lightweight derivatives' ISOs are too big to burn to a CD. Anyway, I think it's definitely fine if you only change it to mention how people should use cd-command for questions about the cd command. Other changes can be made subsequently, by you or someone else. Or if they are not made, your edit will still have made things better. I considered posting something like this as an answer but I think we should probably just close the question as a duplicate. @pomsky Reviewed. One more approval needed. Perhaps the full tag wiki should also mention when cd-command should be used instead. It could also mention the dvd tag and the blu-ray tag. @Zanna That we were meant to be retagging installation questions? If people want to keep questions tagged installation, then I think there is something wrong with its current tag wiki excerpt. We have a number of questions on meta about what to do with installation. A new question about whether or not we should undertake retagging efforts should probably cite them and synthesize the history so far. I don't have the time or, uh, inclination to post such a meta question now. It is possible that I will get to it eventually. If someone else wants to do so, then they can definitely feel free to use (or not use) the title, "Can we escape the enemy [installation] as it crumbles to the ground?" @EliahKagan I've VTC'd that question as a duplicate of the general bug-reporting question. @pomsky Is that question actually no repro? You said that you believe rebooting or restarting Nautilus should fix it. If that can be discerned based on a technical understanding of what is happening, then it's not no repro. No repro means the problem can't be understood well enough to give an answer that is potentially useful to others. If you understand the problem and know that rebooting is a specific solution, then the question should be open and it should have an answer explaining that (and, preferably, also why). Sometimes people reboot (or reinstall, etc.) Ubuntu and their problem goes away but nobody knows why or even of rebooting or reinstalling is a reasonable solution. If someone has a problem where rebooting is known to be a reasonable solution, then that's not no repro. The only reason I haven't yet voted to reopen that question is in case I am misunderstanding your comment (and messages here). is this question a dupe of something? Is this comment clear? Also, I am thinking that, at this point, the OP should be advised to edit the question to include the information from the comment, whereupon it could be reopened and I (or anybody) can post an answer. The information in my comments, taken together, is really an answer. I'll wait a bit for their reply before I suggest that they edit the question so I can answer. (I'll eventually suggest it even if they don't reply, though.) They might have other questions. They might be attempting to use ubuntu-bug and getting rebuffed (though... that does support reporting bugs in -dev packages, doesn't it)? ubuntu-bug unixodbc-dev seems to work just fine. @EliahKagan Sadly I cannot provide any technical justifications for my claim, I just noticed many times changes made to window decoration and theming etc. don't immediately apply to a window of a running instance. Simply closing and restarting the application (or for a nuclear solution rebooting) usually fixes it. Since there was not much info from the OP I hypothesised that OP posted as soon as they didn't see the change in a already running instance. I would have added this as answer had OP replied. @pomsky I think your observations are sufficient for an answer, even though you don't have an explanation. Personal experience is relevant and useful. In my view, the key question is, can you describe the specific conditions under which you have observed that the proposed solution works? Since you can, I think it's better that the question be opened and answered (unless it is a duplicate) than closed as no repro. I don't know how much others would agree with me on this, but if you're comfortable posting an answer then I'll definitely vote to reopen. @EliahKagan If it's reopened I'll post that as answer. hmm... old answer needs editing? @pomsky I've voted to reopen it, and also commented (for the benefit of reviewers--my comment is not actually telling you anything you haven't heard from me here :). If you agree then you could also cast a reopen vote, but this is totally your choice, of course. I think this one should be reopened as per the edit made by OP. They seem to be saying it's not specific to 18.04. But isn't it still a bug? 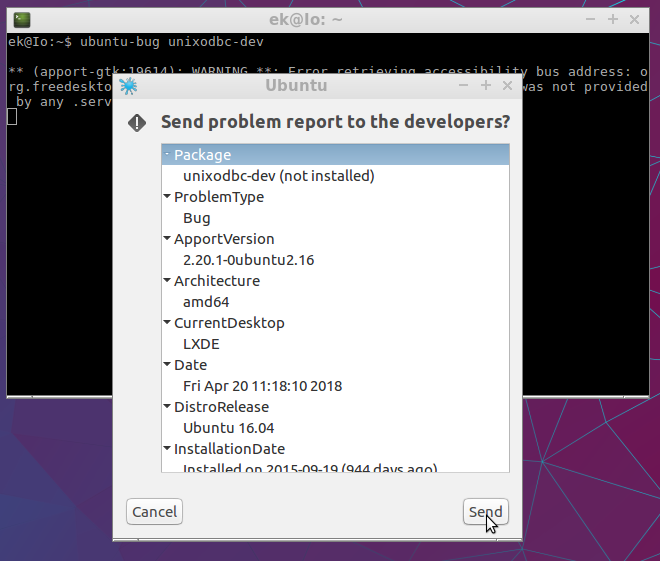 Bug reports are off-topic on Ask Ubuntu even when they apply to releases we support. @Zanna I've gone ahead and posted another comment about how they can use ubuntu-bug and how they should edit their question so it can be reopened and answered. @Zanna We (or anyone) can edit it ourselves and vote to reopen. But I'd rather wait for their edit because maybe there's some other important aspect of the question that they haven't stated. In particular, I'm not sure why they thought they couldn't report bugs against -dev packages. 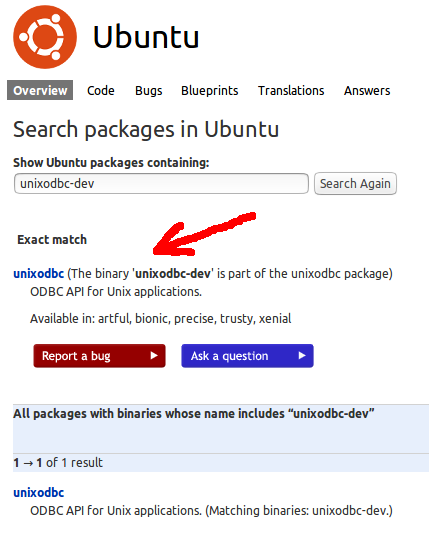 Typing the name of a -dev package into the Ubuntu packages search box on Launchpad typically brings up the appropriate source package, and unixodbc-dev is no exception. Shouldn't this be closed as a bug? @Zanna (and everyone interested) Regarding that question, I definitely don't mind if someone else posts the answer, especially if I'm not available if/when it is edited and reopened. I'm about to go afk, probably for hours, and possibly longer. As usual, but with extra special approval from me in this case :), anyone may feel free to use the text of my comments, the images linked to in my comment, and that image in an answer. @pomsky Yeah, I had noticed that. It was cast before I posted my comment. @pomsky Yes, or as unclear. I've just VTC'd it as OT bug. @pomsky The OP is not sure if their problem really is a bug so maybe the question is worth another look. I commented, mainly to address their question about whether or not they ought to delete the post (I suggested that they not do so), but I don't have time right not to carefully reread the post to figure out if there's a way it could be a non-bug problem. Ttyl. @Zanna Why so? It's an XY-ish problem asking how to choose between ; and &&, right? So it can be answered compactly by explaining the difference between the two, with one or maybe two examples. I can post an answer. But maybe it's a duplicate of something? @EliahKagan It's reopened and I posted that as an answer, comment clean-up? There's another perspective from which an answer to that question question could be written. I didn't bother including it in my answer, and I'm not sure it would benefit my answer, which I think is already complicated enough for someone who is just starting with shell scripting, in spite of my efforts to keep it simple. && is pronounced "and," and it and ; correspond to two meanings of the word "and." ; means to do both things: "Brush the dog and take out the trash." Admittedly is sort of a stretch, because ; specifies sequence and that "and" often doesn't. && means to condition one thing on the other: "Send me a bill, and I'll make sure to pay you back." This one looks very XY-ish. @pomsky Well they say what their actual goal is: they want to "to install IBM MQ." It would be nice if they included more information about the errors directly in their question, though. I've voted to undelete this answer which, though flawed (but not more so than the other answer to which it is similar), actually states a rationale for the commands it recommends, as well as suggesting an approach in the event that one of them were inadequate. Since I believe service names do actually change across releases sometimes, I don't think that second point (though it's not my main reason for wanting to undelete) is pedantic or minor. OT Ubuntu+1 ? It seems like it to me but I guess check the comments adding your VTCs. This answer appears to be attempting to suggest a specific course of action. Should it be edited and undeleted? In this particular case I am not sure. I think this question is unclear. Given it's vagueness, I don't think I would've voted to delete the answer there -- for all we know, it may really address the OP's problem -- but I think it's probably not necessary to undelete it, given that the question should be put on hold and there's essentially no basis with which to evaluate if anything does or does not answer it. I'm finding this one very hard to deal with. 1. This one is about Ubuntu GNOME 14.04 which, being a community flavour, is eol after 3 years (not 5). So potentially off-topic here. 2. But one may claim they have installed gnome-desktop on Ubuntu 14.04 (I think that's possible) and hence on topic! In fact OP didn't use the combo "Ubuntu GNOME" in body, they wrote "Ubuntu:14.04 lts Gnome". But then again it seems they posted a machine-translated version . 3. I think it's very much answerable. The issue is that those themes are designed for GTK3 version >= 3.20, in Trusty the default version must be lower than that. @pomsky I'm not sure I follow. Are you saying Ubuntu GNOME 14.04 is not an LTS? I know that some flavors have not been LTS, but is that true of Ubuntu GNOME 14.04? I think that if they are using an Ubuntu system and all its packages (or at least whatever packages are potentially relevant to their question) are supported then it's supported. That's what we did, or tried to do, with Ubuntu 10.04 LTS's weird extended support situation for a small fraction of the server packages.